New Delhi, April 12: From the low of the Nidahas Trophy final in Sri Lanka to now being in the scheme of things as the national selectors gear up to pick the India squad for the World Cup, all-rounder Vijay Shankar has come a long way. While Indian fans and cricketers await with bated breath for M.S.K Prasad and team to announce the squad for the showpiece event on Monday, Shankar wants to focus on the job at hand -- winning games for Sunrisers Hyderabad. 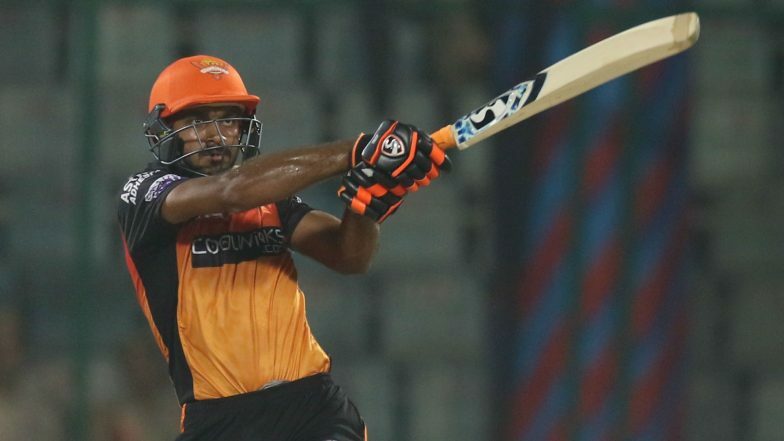 Want to Be a Match Winner for India, Says Vijay Shankar. "Wearing the India cap is a dream for every cricketer. But I haven't let the thought of the World Cup team selection affect me. I have looked to focus and contribute for SRH. "It is very important to do well for Hyderabad. I got into SRH before I made a comeback into the Indian team. So, the trust they have shown in me, must be repaid," he said. "Even in the series against New Zealand, I batted at three and here I have done that for SRH and that is a good thing that has happened. I had a decent series in New Zealand and the most important thing is that when the team shows trust, it gives you more confidence. "It has nothing to do with World Cup, it is about doing what suits the team and the situations." After receiving brickbats post the loss in Sri Lanka, Shankar decided to make sure that he did not put undue pressure on himself and enjoyed the game. And that he feels has helped him in his cause to rise and perform well in recent times. India’s Likely Squad for ICC Cricket World Cup 2019: KL Rahul Could Find a Place; Rishabh Pant, Dinesh Karthik Might Miss Out. While SRH started well, they have failed to be consistent and that sees them currently sitting on the fifth spot after six games with three wins and three losses. Shankar feels that winning key moments will be the key as the team has the perfect balance of youth and experience. Asked if there is any additional pressure now that he is an India player playing in the IPL, Shankar said it is always about giving it his best shot as far as an all-rounder is concerned. BCCI Wants Hardik Pandya-KL Rahul Chapter to End With ICC World Cup 2019 in Mind.